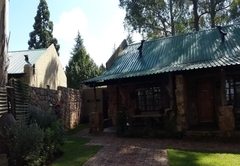 KlipHuisjes is a highly recommended property providing self catering in Dullstroom for tourists visiting the Highlands Meander region. 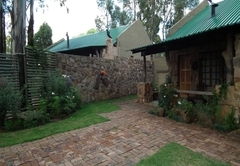 KlipHuisjes is situated in the top notch, easily accessible, area in-town. 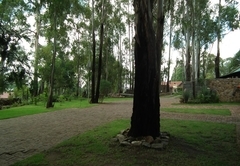 It's located in a peaceful and safe environment hidden amongst huge Blue Gum trees. 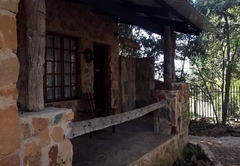 Here you can relax with unspoilt beauty on your doorstep. 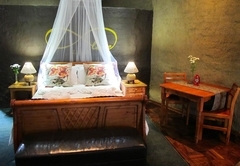 KlipHuisjes at full capacity can sleep a total of 14 guests on the premises. 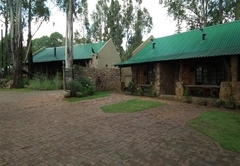 Guests can choose between four self catering units. 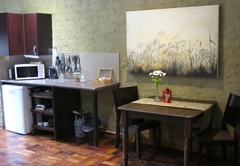 Please note that we do not serve breakfast (we are close to numerous restaurants and coffee shops). 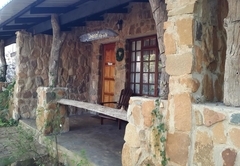 All units are fully serviced every day except Christmas and New Year's day..
"Klip-Cottage" is a self-contained, free-standing and completely private two bedroom stone cottage. 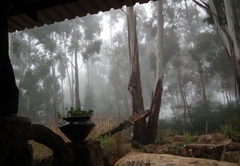 Enjoy the often glorious misty views on the front stoep sipping sundowners while waiting for the braai to get ready. 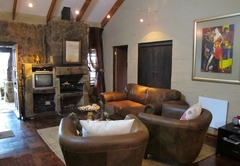 It offers an ultra cozy fireplace in the open plan lounge-dining room and a well equipped kitchen. 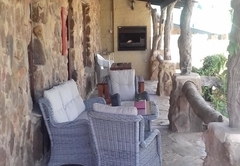 Built-in braai on stoep. 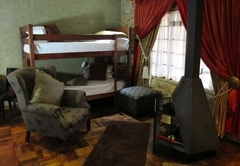 Electric blankets / heaters and fans. 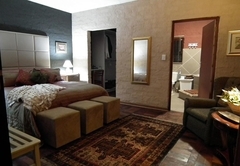 Bedroom 1 has a Queen-size bed, en-suite bathroom (shower), cloak room and electronic safe. 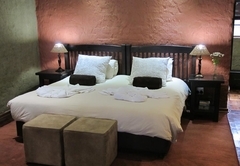 Bedroom 2 has twin beds (conversion to King-size on request), en-suite bathroom (oval bath) and cloakroom. 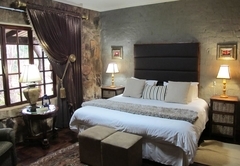 This corner suite is draped and decorated in rich wood and gold finishes with en-suite bathroom fitted with a shower. 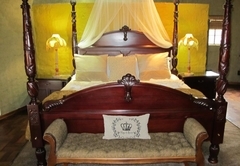 A King-size four-poster bed is dressed with percale linen, duvet, blankets, electric blanket and King-size pillows together with the well placed fireplace which dominates the setting. 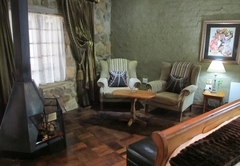 The cosy seating area includes a flat-screen tv, DStv and cd player. Heaters and fans. 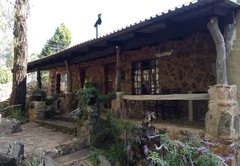 The kitchenette offers a dining table, 100 liter fridge, microwave, sink, single plate stove, tea & coffee making facilities, essential crockery, cutlery, kitchen utensils and private portable braai on stoep. 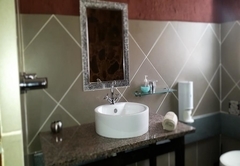 Cleaning services included. Parking at the unit. 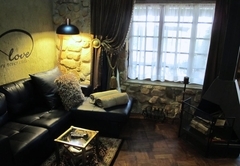 We accommodate special requests i.e. rose petals, champagne etc. 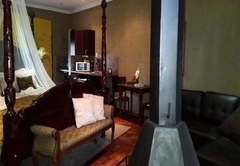 Stylishly decorated corner suite with an en-suite bathroom fitted with a shower, is equipped with a double bed, covered with percale linen and electric blanket with direct view towards the fireplace, dining and seating area. 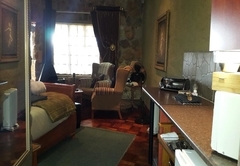 Luxuries include a flat-screen tv, DStv and radio / Cd player. 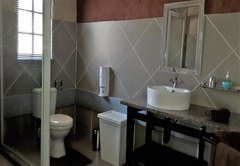 The kitchenette offers a 100 liter fridge, microwave, sink, essential crockery, cutlery, kitchen utensils, tea and coffee making facilities and own private braai on stoep. 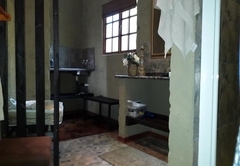 Cleaning services included. Parking at the unit. 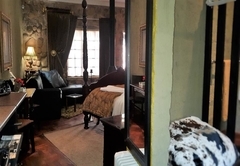 A perfect choice for guests preferring not to share a bed as this unit offers 2 comfy three quarter beds (conversion to King-size on request) and 2 (stacked) bunker beds with percale linen and electric blankets and en-suite bathroom fitted with a shower. 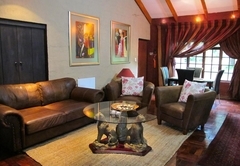 The unit is beautifully decorated in burnt orange with a warm touch of gold colours. 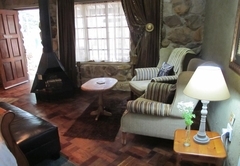 This suite includes a fireplace, dining and seating area, flat-screen tv, DStv and radio / Cd player. 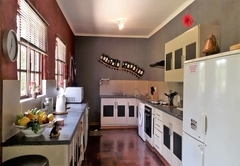 The kitchenette offers a 100 liter fridge, microwave, single plate stove, sink, essential crockery, cutlery, kitchen utensils, tea and coffee making facilities and own private braai on stoep. Cleaning services included. Parking at the unit. 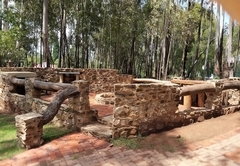 The town is situated on the eastern escarpment and is two hours drive from Pretoria and Johannesburg. 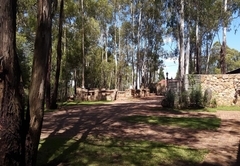 Dullstroom is definitely a destination and an ideal stop over for tourists and holidaymakers on the Panorama Route, halfway between Johannesburg and Kruger National Park. 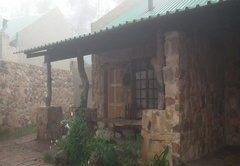 Shopping (less than 1km), fly fishing (less than 2km), mountain biking, quad bikes, walks, beautiful drives and to top it all off - the place to experience a snow fall. Response timeKlipHuisjes typically responds to requests in 5-10 minutes. 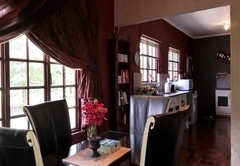 If you prefer assistance on arrival please call us half an hour prior to arrival.